I'm just going to say it, carbs are my best friend. They make me sluggish, tired and do nothing for my waistline but they taste so good that it's hard to not eat. But because I love to torture myself in order to break bad habits I have officially cut carbs off for the month of February. When I first moved to LA I did the South Beach Diet and it helped me lose my sweet tooth (I rarely eat sweets or desserts) and got me into veggies because I was never really a fan. I also learned how to cook fish which I was never able to master before. I mentioned this to a few coworkers and they said it was a great thing to do but eating healthy is so expensive. NOT TRUE! Especially here in Los Angeles where we have access to the best produce for almost half the cost of what it is in NYC. I managed to do groceries for the next two weeks and only spent $42. I may have to grab more sparkling water--if I can' have champagne, I still need bubbles--and a few avocados but I'm trying to stick to Phase 1 of the South Beach Diet while not going broke. Tonight I made a really tasty dinner which I also plan on having for lunch tomorrow. It's my first time making Mahi-Mahi so I was excited to taste it. Needless to say it was amazing and I can't wait to have it again tomorrow. As per usual, I'm not a measurer (I will work on this, I promise) so you can eyeball the ingredients like I did. 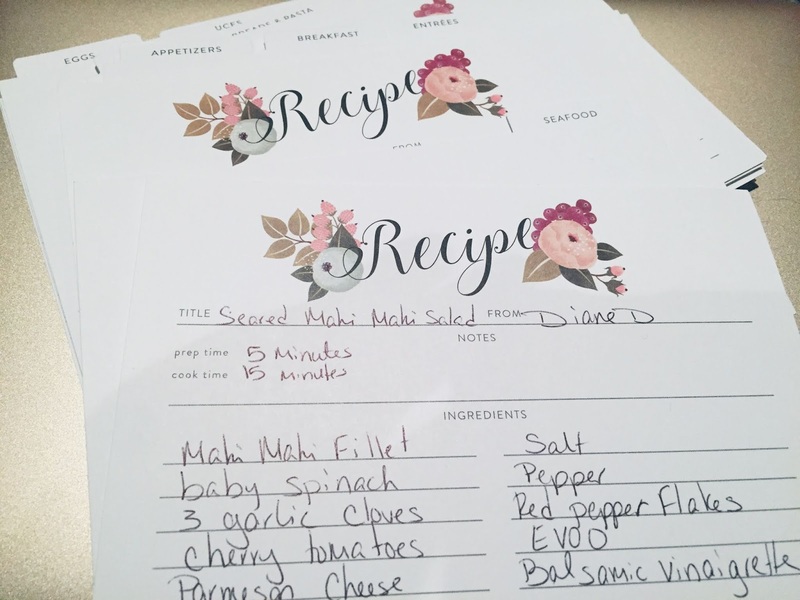 Now what I really love about getting back into cooking is having my recipes ready to share online or in my kitchen. I've never really felt that the things I made deserved a nice display, or a card even, but now thats all changed. 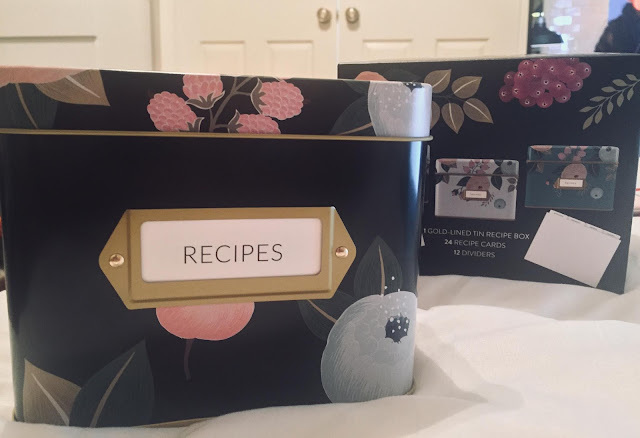 I recently got this super cute recipe box that I can't wait to fill up with all of my tasty recipes. This recipe box by Polite Society comes in a nice tin container that is rust proof, so there's no need to worry about it being near water. So because of that, if you already have a recipe holder that you love, or simply don't use recipes, you can use this in the bathroom to hold samples, masks, or anything that you want al in one place. I really like the cards that it came with and how it's separated into sections for easy reference and the design is super cute. 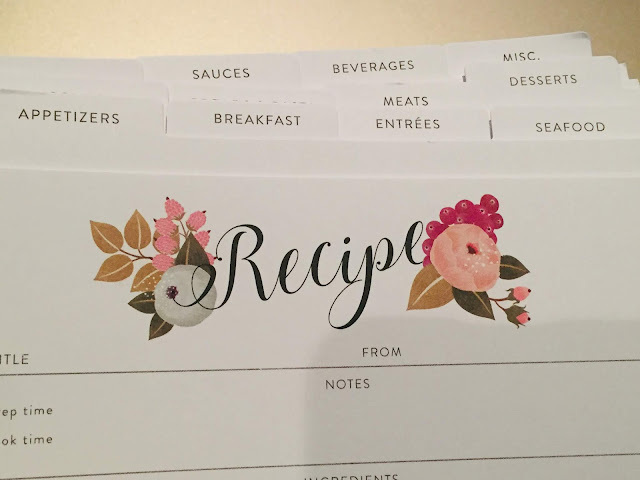 Now I just have to make sure my handwriting gets 1000 times better so that I don't have to preface every recipe inquiry with "excuse my handwriting". I bought the fish last night and was so eager to cook it and then I read that it has to thaw in the fridge for at least 8 hours. FAIL! So after letting it sit in the fridge while I was at work it was ready to get cooked. I put some EVOO in a frying pan and while I waited for it to get hot I seasoned the fillet with salt and pepper. Up next was throwing it in the pan. I cooked it on one side for about 3 minuted and then turned it over. I put the chopped up garlic in at this point to saute it a bit as well as added the red pepper flakes to the fish. In the meantime I cut the cherry tomatoes (omg one of them exploded as I cut it and the tiles in my kitchen looked like a murder scene) and added some salt and pepper to give it a bit of flavor. 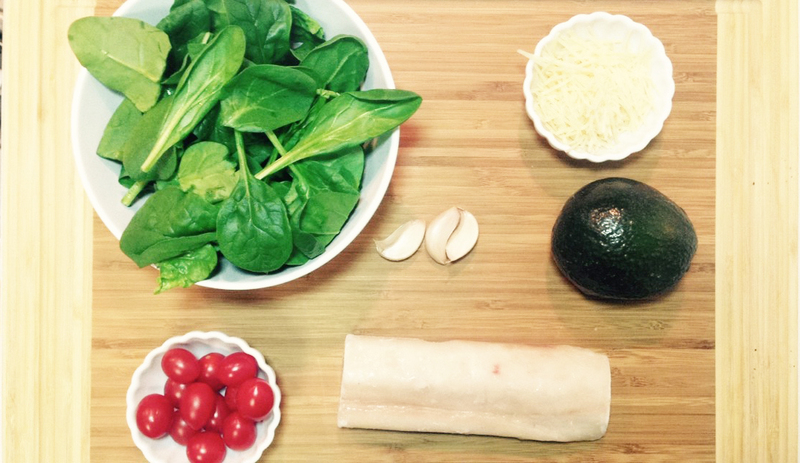 Once the fish was cooked I put my spinach and tomatoes in a bowl, added the parmesan cheese, sauteed garlic from the pan and then the star of the show, the Mahi-Mahi. It was delicious, quick and I can't wait to have it for lunch tomorrow. I'm glad I was able to make something aside from grilled chicken and veggies that is really tasty and carb free. It's not lost on me that there's an avocado in the shot. Originally I was going to put some in it and save the other half for lunch tomorrow but I didn't want oxidation to ruin the color of my amazing lunch so I'll reserve serving with with avocados when I make this for more than one person.